CARE is a distinguished day school, focused on therapy and learning, like no other in Johannesburg. We specialise in Early Intervention, an Adapted Pre-school Curriculum and functional skills at our Centre of Focused Learning. We cater to learners affected by Autism Spectrum Disorder (ASD), between the ages of eighteen months to twelve years of age. CARE is now officially registered as an 'Independent School' with the Department of Education! 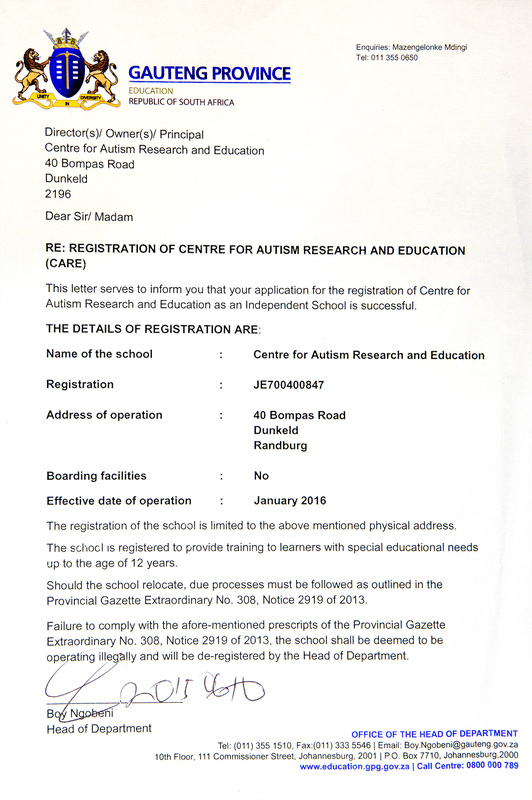 CARE is officially registered with The Department of Education. We have registered in the category of Independent Special Schools. This means that we are operating under the auspices of the Department of Education. In order to qualify for this registration, CARE had to meet certain criteria in terms of curriculum. We follow an adapted version of the National Curriculum and incorporate elements of the Curriculum and Assessment Policy Statement (CAPS) in order to ensure that our education policies are aligned to national policies. This also means that it makes for a more streamlined process when learners leave CARE and integrate into more formal schooling systems. CARE is a fully certified Independent School with the Department of Education. Registration number: 700400847. Click to download the certificate. At CARE, we understand that raising a child with autism is no easy task. By providing you and your child with the facilities, therapies, information and guidance under one roof, our team of passionate ASD specialists are able to implement intervention and offer a strong support system that both learner and parent can depend on, inside and outside the classroom environment. When Occupational Therapist Rozanna Riback founded CARE in June 2011, she had envisioned establishing her dream of creating a holistic intervention centre, dedicated to the therapeutic and developmental needs of children with autism. CARE is not just a school or a treatment facility – it's a safe haven for kids with autism to feel comfortable, cared for, accepted and empowered. At CARE, we emphasize the ethos of being 'different, not less'. Our team specialises in trans-disciplinary assessments and diagnostic evaluations, including the Autism Diagnostic Observation Schedule-2 (ADOS-2). We assess learners' academic, developmental, behavioural and socio-emotional functioning in order to formulate an integrated program that addresses each learner's individual needs. By providing an accurate evaluation and diagnosis of learners' difficulties, we are able to deliver superior educational and therapeutic intervention. At CARE, every child is regarded as unique; special attention is paid to particular, individual variations of how they present on the Spectrum. With us, the happiness and wellbeing of each learner is of utmost importance. Rozanna Riback (Occupational Therapist & Director) and Krishen Samuel (Speech-Language Pathologist & Therapy Director) form part of the executive management team at CARE. Rozanna Riback qualified with a BSc in Occupational Therapy from the University of Witwatersrand in 1998. She has had extensive experience in both South Africa and England. Rozanna has treated both adult and paediatric patients in various settings ranging from medical to educational settings. After a short hiatus from Occupational Therapy, during which Rozanna joined the corporate environment and completed a business degree, she embarked upon opening CARE. Here, she has discovered her passion and lifelong vocation. Krishen Samuel graduated at the top of his class with a BSc in Speech-Language Pathology from the University of Cape Town in 2008. Emerging with a special interest in Autism, he was drawn to paediatric disorders and completed a year of community service before embarking on a career in special education settings. Krishen joined CARE soon after its inception and has thrived in an Autism-specific environment. They bring their extensive experience working with special needs learners, in varied contexts, to oversee and co-ordinate the therapy and educational activities at the Centre. Every member of the team is there for your child, as well as for you as a parent. We're here. We care. "For the past 3 years, both of our autistic daughters have been attending CARE- with excellent results. It is our view that none of this would have been possible without the dedication and commitment of Rozanna and the CARE team."